This guide was written by long-time community member CAnon! He's contributed so much to the community, from his cool customs in our custom character tournaments to general memery! He's also, of course, a Magdelina player. Maggie is favored against opponents who have consistently low to average power, like Marmelee, or who struggle to consistently hit. Likewise she can do well against most other clockers, like Eustace, as her build-up may potentially be slower but will certainly “outscale” by providing larger and more consistent boosts once underway. Her problems emerge largely against characters who can rush her down before she has a chance to hit her power-spike, such as high power monsters like King Alexian. Additionally opponents like Tanis with large amounts of repositioning or movement can run rings around her limited range. Magdelina is an escalation character who starts laughably weak but, if she can survive long enough, gains enough raw stats to just trample her opponents. Between Dodge, Safety, and Priestess and/or Blessing, you have a lot of ways to negate, minimize or undo incoming damage early in the match. How successfully you can deploy these tools can determine whether or not you survive to mid/late-game. Provided you can avoid predictability and confirm the hit, repeated and common usage of Blessing (or use of Apotheosis if available) can significantly accelerate your advancement up the levels, whilst helping keep you topped off on life. While you will generally be looking to win during levels 3, 4, or 5, you can still opportunistically poke and trade even as early as Beat 1, if a good chance presents itself. Spiritual helps make this count, and should be relatively unexpected. Just make sure you don't miss and (by extension) further delay your growth. Magdelina fills an interesting role in team compositions. On the one hand, she can be relied on to beat most clockers or weak-to-average enemies, given time. However the tournament meta seems focused around rushdown characters and the one “clocker” who is exceptionally popular at high level play, Thessala, can both rush her down early and remain highly competitive against her late. Nonetheless, this means that unless your team has no other answers to their composition, opponents are unlikely to ban her which can be a great boon if you are very familiar and capable with her. Magdelina’s Unique Ability is Divine Conduit. Essentially, she gains a Trance counter at the end of each beat and, if her current pool has more counters than she has levels, she empties the pool and levels up (except on end of Beat 1). For each level she has (starting at level 0, with a maximum of 5), on ante, she gains +1 Power, Priority and Stun Guard per level possessed. This means she becomes stronger, faster, and more secure the further she levels and can reach truly oppressive ability late game. To balance this, most of her styles have printed negatives of -1 or -2 on power and priority. Nonetheless, the consistency of having these +X bonii to everything - and the safety in the knowledge they can only increase from here - means she loses far less to bad reads than others with similar bonuses who probably need to expend resources to reach such power or speed (and will certainly struggle to get both). One thing to note is that they are bonuses, and so can be negated or stolen by effects that reduce her down to printed values. This makes her match-ups versus tricky characters like Sagas, Lixis and Tanis quite hard. Sanctimonious is kind of a reflection of Maggie herself - a frankly terrible style to begin with. Yes, it has the 2nd highest printed power among her styles - at -1 - but it's also the slowest and effectively without any bonus range or effects beat 1 (or any other beat directly after you level up). However it does have an effect. It gains +0~1 range per Trance counter in her pool. This means, in the late game where you are at level 3 or 4 and are therefore able to hold 2 or more Trance counters, you do have access to that thing Maggie craves: Hit confirm, to make the most of her inflated stats. Additionally, by then you should have enough cumulative priority or Stun Guard that you would rather have the -1 in power rather than priority, to make the most of your somewhat limited windows of opportunity to hit. As a result of this effect, Sanctimonious pairs great in the late game with two of the Bases most in need of Range: Strike and Grasp. Strike is obviously a pay-out attack: hit with high power, relatively fast, probably at such range that they can't beat it, only evade. Grasp, meanwhile, hits fast and threatens to throw them out of their range (assuming they aren't stunned outright) or to drag them in closer for follow-up attacks next beat. Excelsius is similar - it has less power and more priority, but it also has range (a very small amount) and even some movement to boot. Just be aware that the movement is mandatory and, as such, can lead to you walking out of your own range or into the opponent's. Excelsius, due to this hit confirm, is pretty okay throughout, though it is undeniably at its best in the mid to late. This is due to an effect it gains at Level 2 and above which allows you to push the opponent, On Hit, up to 2 spaces. This lets you push them out of range if they could retaliate, while also allowing you to choose not to push if it would be of greater use to you. Combined with the movement, the push effect helps you set up future null beats to exploit for “cheaper” levels. Excelsius Shot has a plethora of range and can help send opponents to the opposite end of the board, if that would most inconvenience them, whilst Excelsius Blessing gives Blessing the extra hit confirm it needs to ensure you get the Trance counter and sustain to accelerate towards the next level, and the push (again) potentially stops any retaliation. Spiritual is her pay-out Style - printed positives on both power and priority on Magdelina makes for one strong hit levels 3 and above, but also opens up the intriguing possibility of early damage. However if you fail to hit, you will not get a Trance counter this beat. As a result, it is certainly best late when you can exploit your bonus power and priority further, but also when there is less opportunity cost. Fundamentally, the difference from level 3 to 4 is less important to Magdelina than between 1 and 2; when she first gains neutral or positive stats on everything and when Excelsius gains it's On Hit. However, if you can poke them with a quick Spiritual Drive for 4-5 damage early, it should be unexpected and help put them more on guard, hopefully relieving some pressure. Spiritual has no range and so pairs well with Shot and Drive. Drive goes faster, making it more playable earlier on, but loses to Dodge even if you're in the corner (as they can just retreat 3 spaces). Shot meanwhile does not have such a limitation, you just need enough levels to make it safer from their threats - level 3 or even level 2 should be enough, as you'll be going at priority 5-6 and any attacks which can out-speed that are unlikely to breach Stun Guard 4-5 (especially if you throw Force Gauge Priority or Stun Guard on it). Priestess helps give you a bit more survivability in the mid-game, when you've outgrown Safety but aren't quite ready to start taking your opponent apart. It has the standard Maggie 0/-2/-1 spread of range, power, and priority, along with an On Hit debuff to the opponent's power and “After Activating: Recover 1 life”. It's difficult to play early as all its benefits are lost if the opponent out-speeds and stuns you, whilst it lacks the range or power to be an optimal style late. Nonetheless, mid-game, it can effectively give you Soak 3 provided you hit first. Priestess pairs well with Drive to hit fast and activate its effects. If you aren't worried about Burst or Dodge it can also work with Blessing, which gives you 4 life recovery, a Trance counter and inflicts the -power on the opponent (at the expense of healing them also and not doing any damage yourself). Safety saves lives. Again, the standard 0/-2/-1. However it passively caps the damage you take to 3+L (where L is your level), which hugely increases your survivability early-game (and even into the mid- versus the real heavyweight fighters). It also gives you an “End of Beat: Move up to 3 spaces”, provided you were hit this beat. This means you can use it to take a minimal amount of damage this beat and simultaneously create enough range to set-up a null beat for the next. Safety Blessing is great. The range is not great, but it's an attack with effective Infinite Stun Guard (due to SG3 on Blessing, damage cap at 3+L, and each level giving you +1 SG), which accelerates your growth and (at level 1) only “loses” 1 life (provided you manage to hit back). Safety Strike could also work as a trading pair - you'll at least trade even with FG Power, but the range is kind of a crapshoot. Maggie's Unique Base is Blessing. It has a pinch of range, average priority, Stun Guard 3, and power N/A. You see, Blessing doesn't actually do damage. 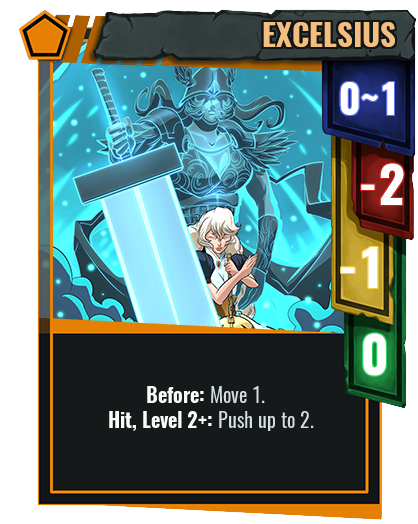 Quite the opposite, its On Hit effect gives Maggie a Trance counter, and both her and the hit opponent recover 3 life. This is great for her as it not only shortens the amount of time for which she needs to stall but also provides her with the sustain with which to achieve it. Therefore, you want to play it often and make sure you hit, to spend as little time on levels 0-2 as possible. Something to note is that (due to the clause in your UA preventing you from reaching Level 1 before the end of Beat 2) you don't need it in hand before Beat 3. Therefore it is fine - and indeed, probably optimal - to place Blessing in your Discard 1. As mentioned above, it pairs well with Safety early, and Excelsius late. Printed +0’s (and an extra point of Force) makes Switch an incredible card for Magdelina. It's effectively a mini-Spiritual, without the penalty for missing, which is understandably pretty great. As such, consider whether Switch might be a better or safer play any time you are tempted to use Spiritual. Apotheosis is range 1, power 1, priority 4. If the stats look underwhelming for a finisher, bear in mind Magdelina’s bonuses are applied to her directly so her finishers do get her Level bonuses also, not just her attack pairs. At Level 3, for instance, it becomes 1/4/7, with Stun Guard 3, which is much more palatable. But the main reason to use it is because “On Hit: Magdelina gains a level”. Note that, unlike when she levels up via her UA, there is no mention of discarding Trance counters. As such, if she were on Level 3 and 3 Trance when she lands it, she immediately jumps to Level 4 and 3 Trance, basically saving her 4 beats worth of Trance collection. Apotheosis, properly used, is huge. It can swing games single-handedly, or be the final push needed to close out one she's already leading. Just be aware of the very bad range, as Start of Beat movement ruins it. Solar Soul is 1~2/2/4 with Soak 2. The extra point of range isn't huge, as she's likely got enough levels to outspeed Grasps by the time she's in Finisher range, but it does make the attack slightly less telegraphed than Apotheosis (even if it still loses to exactly the same things). “On Hit: Discard any number of Trance counters for +1 power each” is a nice way to land a single, super-heavy blow, but kind of misses the point of Magdelina, I feel. It doesn't do a huge amount more damage than her basic attacks at the same levels, delays further power spikes, and can probably only win games if it's already fairly close - in which case, I'd rather do two safer basic attacks than one finisher which could easily whiff. That said, in the situations where you can't risk two attacks (or could be counter-attacked) it could have a place, and the Soak is a nice touch.